This one is quite simple to build. The design expects you to print double-sided on an ink-jet (unless of course you have a colour laser at home!). However, the solid blocks of colour on the reverse sides use a lot of ink, so you might like to just leave them white, or colour the reverse sides of the cut-out pieces some other way.. I used 200 grammes per square metre paper-board. No problem at all in my HP PSC1315 printer. 200gsm is about 0.65 ounces per square foot, best as I can work out. 80gsm is normal photocopy paper here in Australia. No picture of mine at present, as I gave it to my daughter. 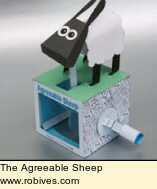 She works in student support at a university, and perhaps the "Agreeable Sheep" can help them get their questions answered right away!